Casa Bellamy is located on the third phase of a well established development and the single storey build, is approximately 11 years old. Located under the La Vinuela town hall, all services have been finished by the developer including tarmac roads, mains sewers, water and electric etc. 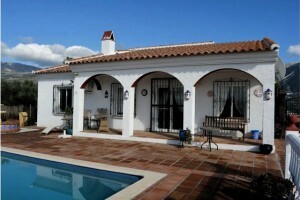 The property sits on a fully enclosed plot of 400m2. A peaceful environment with unbeatable access and a number of bars and restaurants within a 4 minute drive. The lake and mountain views views are very special and are certainly a major selling point to be fully appreciated upon viewing the property! The villa itself is well built with three bedrooms all with fitted wardrobes and AC, a bedroom with ensuite and one general bathroom The property consists of a very light and airy open lounge attached to a fully equipped, independent kitchen with plenty of unit space. The lounge has AC, curtains, fitted wood burner and a large patio door leading directly onto the covered pool terrace and views. This terrace overlooks the stunning lake Vinuela and the heated pool is located in front of the property so you can enjoy both pool and lake views from the comfort of your own lounge. Secure parking for a number of vehicles up the side of the property and low maintenance gardens. Casa Bellamy is very well maintained, stylish lake view villa, with many extras which will become apparent when viewing the property.